2018 was definitely “The Year of The Podcast” for me. Perhaps it’s because my team and I started offering podcast management as one of our specialty services and were privileged to launch and manage several successful podcasts. Or perhaps it was because this was the year that I started my own podcast- How She Did That. Those could be the reasons but I suspect that it was mostly because 2018 was busy! And when I’m busy and on the go, podcasts make it possible to still learn things and feel a part of my business community. 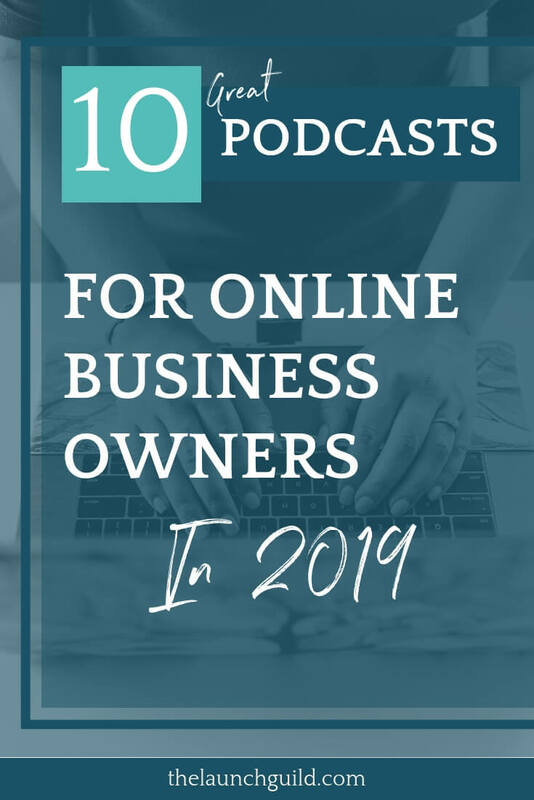 So today, I’m sharing with you the 10 Podcasts for Online Business Owners that I’ll be listening to in 2019. Jordan Gill is a rockstar at Online Systems and Operations but on top of that, she’s just an all around down to earth, amazing person. Jordan’s podcast was one of the first I started listening to a couple years ago. It’s a must for anyone in the Online Support world and was definitely an inspiration for my own podcast. Check out new episodes of Systems Saved Me every Wednesday. If you already have a team or one of your goals is to build a team this year than this podcast is a must listen! I like it because it’s straight to the point and gives easy to implement tips about hiring and managing both virtual and in person team members. New episodes drop every Tuesday. All I can say is that, if Online Marketing Made Easy is not one of your weekly podcast must haves, you’re missing out. Amy Porterfield is kinda the gold standard when it comes to online courses and launching and she’s done such an amazing job with this podcast. No matter the topic, I always leave with at least a couple new nuggets of insight. Look for new episodes from Amy every Thursday. Kate Ahl has built a crazy successful Pinterest Strategy & Management Agency and is my go to for all things Pinterest. If you’re a Pinterest Manager or a business owner who is looking to add Pinterest to your marketing plan in 2019 then this podcast is one you must check out. Kate launches new episodes every Tuesday. Melyssa Griffin was one of the first course creators I started following back in the day and I’ve continued to appreciate her raw honesty in both the ups and downs of being a seven figure online business owner. In recent years, Melyssa has been focused more and more on helping business owners find alignment in their lives and her podcast does a great job of not just talking about business successes but also the hard times. I’ll be super honest and tell you that I haven’t started listening to Jereshia Hawk’s podcast yet but I’ve been a huge fan and follower of hers for a couple years now and have heard nothing but positive amazing things about her podcast, Jereshia Says. Jereshia is an engineer turned full time entrepreneur and has always been honest and relatable. New episodes of her podcasts are launched every Wednesday & Sunday. Screw U, the online community founded 4 years ago by Jill and Josh Stanton, recently closed however their podcast lives on and is growing in an even bigger way. I had the privilege of being a part of their online membership community for almost 2 years before it closed and I got to attend their live event two years in a row. Jill & Josh have made a name for themselves not only for helping people pave a way to leave their 9 to 5s and become full time entrepreneurs but because they’ve given them permission to do it on their own terms and in their own way. Screw The Nine To Five drops new episodes three times each week. Nicole Walters became online famous when she quit her corporate job live on Snap Chat but she has maintained a strong following because of her no nonsense yet hilarious approach to life and business. Nicole just recently launched her podcast and it went all the way to #1 on the iTunes Business Podcast Charts in only 4 days!!! She’s really that good and I can’t wait to keep listening. What can I say about Rachel Hollis? Ugh! I just love her so much I can’t even!!! Rachel took the world by storm this year when her book, Girl Wash Your Face, became an best seller and eventually made its way all the way up to #2 on the Amazon Best Sellers of the year list. New episodes are available every Monday. Here is a word of caution- do NOT listen to Jadah’s podcast when sleepy or when lying down because you will fall asleep. Seriously, this woman has one of the most soothing voices I have ever heard and, if this online business thing doesn’t work out for her, she should seriously consider becoming a hypnotist because her voice is like butter! Anyway…Jadah is an Online Community Growth and Business Strategist that I heard speak at Jill & Josh’s event last year. She has one of those personalities that you instantly connect to and her podcast continues that experience. Jadah publishes new episodes every Tuesday. I’ll love for you to comment below and tell me what podcasts you’re listening to this year.